PreSonus Studio One is one of the newer DAW programs available today. It was first released in 2009 and was actually co-created by one of the early developers of Cubase. This is probably why the user interface looks a lot like Cubase. 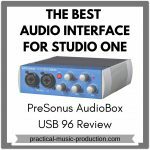 Studio One takes great advantage of the seamless integration with PreSonus hardware, like the popular AudioBox audio interface. 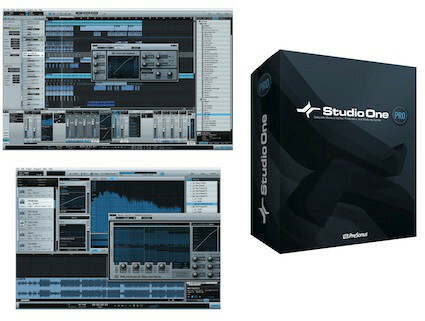 In fact, Studio One comes packaged with most PreSonus hardware nowadays. It makes it really easy to quickly set up a studio computer for recording and producing. The DAW from PreSonus has implemented lots of great features that are largely designed to speed up workflow in the studio. 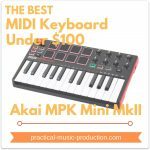 You can use the program on both Windows and Mac systems, and it competes strongly with more well-known DAWs like Logic Pro and Cubase. When you open Studio One you’re greeted by the start screen. This is where you can access many of the DAW’s great features. One of these features is the large group of song templates. Opening a template is like opening a pre-made session. They save you time because you don’t always have to set up your sessions from scratch. One example is the singer/songwriter template – when it’s opened, there are two audio tracks that are already armed for recording. If you already have your microphones set up then you can start recording immediately. The news feed is where PreSonus sends you new information you may be interested in, like new updates, tutorials, or commercial offers. 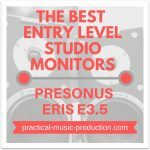 This is such a great idea, as you don’t have to spend any time searching the internet yourself – PreSonus brings the information straight to your screen. Setting up your Artist Profile lets you become a part of the online Studio One community, where you can upload your songs and productions straight to SoundCloud for other music fans to hear. I think that this is a feature that will become more widespread in other DAWs in the near future (Acoustica’s Mixcraft already has something similar). PreSonus Studio One also has a feature called the Exchange. Users can upload certain parts of their sessions, like effects chains, effects settings, and groove templates. Other users can then download these for free and use them in their own sessions. It’s a great way to share creative discoveries with other musicians, engineers and producers. Studio One has introduced a superb new feature that allows instruments and effects plugins to be brought into a session using the drag and drop method. From the browser window, you simply drag your plugin into the position that you want it to start taking effect. It’s another innovative way to speed up your workflow and is a more efficient way to insert processors, effects, and instruments into your tracks, when compared with other DAWs. The plugins that are part of the PreSonus Studio One package are great quality, and you can also use third-party VST and Audio Unit plugins as well. Using drag and drop effects could help you create really interesting sounds for your music productions. Studio One comes in three different versions – Artist, Producer, and Professional. You can also download a Free version – this is a great way for you to try out the program. Each of the three versions has a different set of features. Artist is the most basic and Professional is the full version that houses all the available features. Producer is the mid-level package in between the two. A great selling-point for the Professional version of the DAW is the inclusion of the famous Melodyne program from Celemony. Melodyne has become the industry-standard studio tool for audio pitch correction, taking over from Auto-Tune. 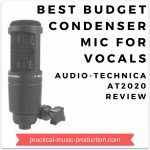 It’s a program that costs just under $300 to purchase by itself, so its inclusion with PreSonus Studio One Professional is a massive bonus. Studio One is definitely one of the best of the new breed of DAWs released over the last few years. The inventive new features that are described above have shown the more mainstream and established DAW makers that there is still room for innovation, especially in making the software more intuitive and in helping to streamline workflow. If you’re a long-time user of either Logic Pro or Cubase but you’re thinking of making a change in your studio software, then I recommend you take a look at PreSonus Studio One (the link takes you to the official site) – it might be the creative boost you need to take your music productions up to the next level.